The White House released the personal financial disclosures for both President Obama and Vice President Biden earlier this week. One of the things that has always stood out about Joe Biden's personal financial disclosures is the amount of debt that he carries, especially when it comes to home equity lines of credit (HELOCs). 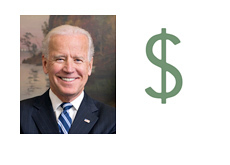 The good news for Biden is that he was able to pay a number of these down in 2013. He paid off two HELOCs during the 2013 calendar year that had, at one point during the year, balances of between $100,001 and $250,000. In addition, Biden paid off his mortgage at TD Bank but appears to have moved it to the Wilmington Savings Fund Society. Biden still has a number of liabilities, including the mortgage on his principal residence (including his rental property), a home equity LOC that had a balance of between $250,001 - $500,000 sometime over the course of the year and loans against the cash value of some life insurance policies. In addition, Vice President Biden is also a co-signed on a LOC for his son that had a balance of between $15,001 and $50,000 at some point in 2013. The Biden family's largest asset is almost certainly their principal residence, but that doesn't have to be declared on their personal financial disclosure. For that reason, the net worth numbers are always appear lower than what they actually are. According to Biden's personal financial disclosure, his largest asset (aside from his primary residence) is a rental property located in Wilmington, Delaware that is valued at between $100,001 and $250,000. In addition, the Bidens also own a couple of Certificates of Deposit at the Wilmington Savings Fund Society that are valued at between $50,001 - $100,000. In addition to the salary that he collects for serving as the country's Vice President, Biden received between $15,001 and $50,000 from his rental property, as well as between $15,001 and $50,000 in book royalties. Vice President Biden's financial situation is not nearly as solid as say, President Obama's, but Mr. Biden was able to pay down some debts last year. When it comes time to calculate his net worth next year, the Vice President should be on substantially better footing.